Barrons Educational Series, 9781438010441, 912pp. More than 5,000 terms related to stocks, bonds, mutual funds, banking, tax laws, and transactions in the various financial markets are presented alphabetically with descriptions. The new tenth edition has been updated to take account of new financial regulations and recent dramatic swings in equities, credit, and other financial developments, including the Tax Cuts and Jobs Act of 2017. Readers will also find a list of financial abbreviations and acronyms, as well as illustrative diagrams and charts. 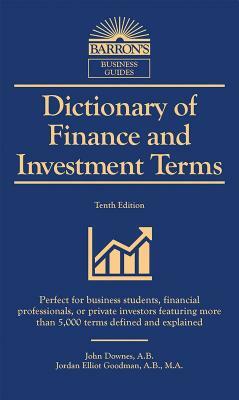 Here's a valuable, thorough dictionary for business students, financial professionals, or private investors. Titles in the Pocket-size Book series were compiled and written by recognized authorities in their fields. Like all titles in the series, this book lists and defines several thousand specialized terms alphabetically.